We visited Whitby Folk Festival for the first time and I rekindled my love for folk music. I particularly enjoyed listening to The Melrose Quartet and heard them again in Nottingham later in the year. I managed to practice more yoga, including on our trips abroad: I’m very grateful to my lovely teachers especially as the breathing techniques helped me get through a gastroscopy procedure. We went on a lovely relaxing trip to Greece. It took a long time to get to Papa Nero on the Pelion peninsula, but it was beautiful and tranquil once there, with lots of swimm ing in the sea. I danced in three countries: I feel privileged to know the strong and supportive women in my circle dance group. I spent many lovely evenings with a group of good friends I’ve known for years, including meals out and activities including making jewellery and painting pottery: and joyfully celebrated some 60th birthdays. A friend got married and I went to my first hen party (a couple of days at a spa)! I enjoyed stage performances: Tommy and Bluestockings, and danced with Peter Kay at the Dance for Life. I’ve had many great conversations, online and in person, with my wonderful sisters, and saw a lot of my Dad. A relative was able to take advantage of a new surgical technique and was treated successfully for cancer. I won or nearly won some online card challenges with my handmade cards and enjoyed making cards whenever I could spare the time! I went to a lovely Chinese brush painting workshop organised at work: what a fabulous event at which to spend an work afternoon! 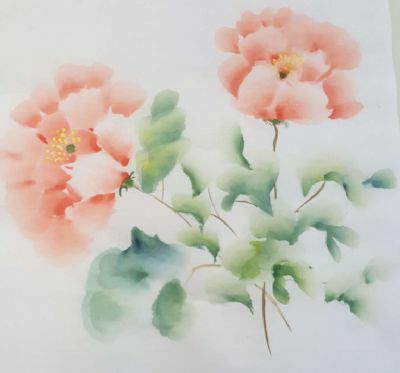 I created a painting of peonies (I couldn’t reproduce it again without the wonderful teacher (Jack) Jiang Hongsheng though…). I work with a great group of knowledgeable and talented learning technologists: it’s great to have a team to help solve problems and we have fun together too! I attended and presented at the Association for Learning Technology Conference in September. It’s always good to get a chance to be inspired by others’ work and ideas. I had a lot of fun with educational escape games during the year, including creating the one to teach online marking and one as an icebreaker for a group of medical researchers. I was involved in some meaningful learning projects including a new course on Liberating Slaves, and one on Dementia. My online facilitation courses (“Becoming an Online Facilitator” and “Online Facilitation and Designing for Engagement”) were very popular this year and I taught several for staff and some for students too. There are lots of things here that remind me what makes me happy. I must remember to make sure they feature again in 2018! And I haven’t included my own family, who provide me with happiness every year (soppy but true). This will be a great list to revisit when I’m feeling down. If you have moments like that – make your own list!